In previous studies, the researchers found that, in rabbits, infections from one of the parasites are controlled by the immune response, whereas infections from the other parasite species are not controlled, even though the rabbits do mount an immune response to the parasite. Therefore, the researchers designed the new study to understand the contribution of climate change and immunity on the long-term and seasonal dynamics of infections caused by the two rabbit parasitic worms. They examined samples collected monthly between 1977 and 2002 in Scotland. We are seeing an increase in very sick kids in the emergency department where I work. The running theory that has been heard throughout the department is that we did not really experience a solid winter this year. It is advantageous to humans and animals to experience the brisk, cold winter as it is crucial for the destruction of bacterial cells and viruses. Due to the warmer, almost lack of a winter season and frigid cold the bacteria and viruses have not been wiped out. Similar to the rabbits, small children do not have a sufficient immune response to mount against these bacteria. As they are increasing in numbers, they are able to infect more people and lead to an increase in hospitalizations. Last Friday the ER, out of 400+ children seen, more than 1/3rd of them were admitted to the PICU and critical care units, which is unusual. Most of the patients were having difficulty breathing, required oxygen and were on continuous breathing treatments with little success and relief. As the world gets warmer, this emerging issue affects all living creatures including plants, animals, humans and even marine life. There are many issues with coral bleaching currently occurring in the tropical areas due to a previously symbiotic relationship between corals and their bacterial symbionts zooxanthellae. Similar to the rabbits being able to keep the parasitic infections at bay, the coral and zooxanthellae developed coexistence with one another. The coral provides shelter for the zooxanthellae while the algae perform photosynthesis which the coral benefits from. However, due to the increase in sea water temperatures, the coral is stressed and unable to provide the necessary components to the zooxanthellae for photosynthesis which leads to an expulsion of the algae from the coral. This is what is defined as coral bleaching. The zooxanthellae are what cause the coral pigmentation so as they are expelled from the coral the coral returns to its natural translucent color (which appears white due to the light refraction). Over time, if the balance is not restored the coral succumb to its deprivation of nutrients provided by its symbiont and it dies. This leads to a chain reaction of damaged coral reefs, decrease in numbers of fish and animals living on the coral reefs, lack of food, and oceanic organism decline which as we know has effects on humans as well. The event of coral bleaching can be seen as an immune response the coral activates when it is stressed. The high temperatures create a disruption in their natural calcium stores as well their immune system seems the mount an immune response towards the zooxanthellae leading to its expulsion. Climate change affects more than we are currently aware of and through the research on the impacts of animals and parasitic worms and marine biology we are able to forecast some of the consequences of this drastic event. Health organizations as well as environmental advocates need to adjust not only the way in which we protect these plants and animals but adapt how infections are treated and prevented. Understanding the life cycle of parasites and other such organisms can prepare us for the drastic changes that will lead to an increase in infections, hospitalizations and treatment plans. There may come a day when the parasites that currently infect humans in third world countries start thriving in our society due to the increase in climate and ability of them to survive in places they normally would not. The world is changing due to human influence, not in the best way either. It is now up to humans to figure out how to fix and restore what has been damaged, not only for our sake. I think the research article brings up a very important point in establishing that host immunity determines the extent of ill-effects global warming can incur regarding parasitic infection. However, when we consider parasitic infections, while helminthic infections are one of the most common forms of parasitic infections, they do not account for the highest morbidity rates and are easy to treat affordably. Other parasites should be of more concern when regarding the possibility of their territories spreading. If we’re considering North America for example, Chagas disease is being spread into the US increasingly with the reduviid bug being able to live in the warming climate of many southern states. Chagas has no vaccine, and the current treatments are often ineffective at eliminating the entire infection. You can also look at the spread of parasitic infections like Malaria. As tropical climates spread due to warming, so too does mosquito territories that bare these terrible disease. These parasitic infections are much more serious, much more deadly, and much harder to treat and prevent than helminthic infections. Our efforts should be focused on stopping more pertinent diseases. The lack of immunity leading to a severe infection in the older population may not be the only reason for the positive correlation between infection severity in the older population of rabbits and rising climate change. Studies show heat stress has been positively correlated to a weakened immune response. A study showed heat stress (and humidity) in hens resulted in significant decrease in body weight, feed consumption, and egg production. White blood cells count decreased, and mortality rates were higher among hens exposed to heat compared to the control group. Another study showed weakened innate immunity response and increase virulence in mice infected with Influenza virus H5N1 when exposed to chronic heat. If innate immunity is weakened, the adaptive innate response will also be affected, and thus the ability to provide a strong immune response under warmer conditions. The rate of rising global climate has been directly affected by humans. Changes in habitat for wild rabbits due to deforesting, fire, etc. could cause the wild population of rabbits to migrate, allowing for the interaction with new species of parasites. 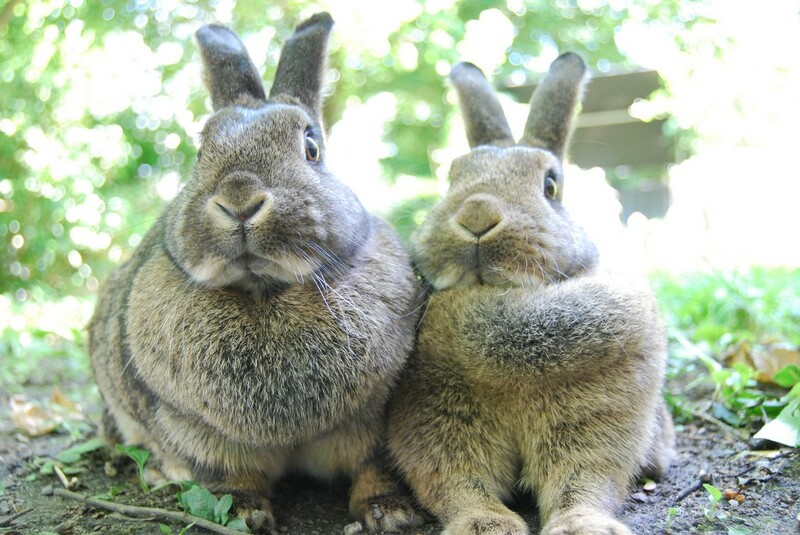 Stress hormones released due to changing environments in conjugation with the actual temperature change can significantly impact a rabbit’s immune system, ESPECIALLY in the older population. Perhaps the increase in infection in the older generation is due to the profound effect the heat has on the immune system? Perhaps the “non-immunogenic” parasite does indeed produce an immune response in the older population of rabbits but they cannot effectively clear the infection due to the stronger impact the heat has on their aged immune system. Global warming significantly impacts human health, and its affect can also be observed in animals. The increase in infection severity in response to rising climate warming may be a product of longer surviving infectious parasites in conjugation with the lack of immune response in wild rabbits, but there are other factors that may explain the increase in infection severity primarily among older generations. It would be interesting to study/observe exactly how the immune system recognizes the immunogenic Trichostrongylus retortaeformis parasite, as the information regarding biology and life cycle of the non-immunogenic Graphidium strigosum is scarce.